The deadliest hurricane in U.S. history was not Hurricane Katrina. Not even close. 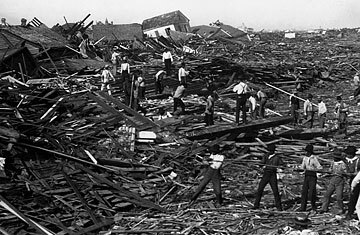 It was the storm that hit Galveston, Texas, exactly 108 years and one week ago. That storm killed about 8,000 Americans and leveled what had been the largest city in Texas. It was a vicious storm with 130 mph winds. But, like Katrina, it needn't have been as deadly as it was. Today, the 1900 Hurricane has been largely forgotten. But the memory resurfaced like a violent flashback on Sept. 13, as Hurricane Ike demolished Galveston once again. Now as then, there are stories of open sky where homes had once been; of beaches blanketed by lumber; of loss beyond reckoning. This time, though, the number of dead appears to be very low. What was different in 1900? For one thing, the storm was stronger than Katrina  estimated at about a Category 4 when it hit Galveston. For another, the government's attitude towards such storms was far more arrogant than it is today. The U.S. Weather Service did not even like to use the words "hurricane" or "tornado," as Erik Larson details in his book about the disaster, Isaac's Storm. Officials did not want to panic anyone, a problem that still exists today in other forms  even though we now name our storms well in advance and spend days warning people to prepare for the worst. Forecasters were overly confident in their primitive technology, which did not yet include satellites or doppler radar. And they were distrustful of Cuban forecasters; before the 1900 storm, U.S. forecasters had a policy of ignoring or downplaying warnings from Cuba, even though the island generally experiences storms well before the U.S. In all, the government's role made its response to Katrina look almost elegant by comparison. When the storm made landfall, many members of the public had been warned to get to high ground. But too many did not or could not get high enough in time. As local forecaster Isaac Cline wrote afterwards, "Where 20,000 people lived on [Sept.] 8th not a house remained on the 9th, and who occupied the houses may, in many instances, never be known." On the beach, where St. Mary's Orphanage had once stood, rescuers found the bodies of some of the 93 children who had never left.